Clan Giovanni joined the ranks of the undead and ascended to power through backstabbing, butchery and bloodshed. Now you can live this page in Vampire history by staging the events of the Giovannis rise by being a part of it. Join the usurpers or resist their claim as Kindred. Just be certain youre on the winning side. 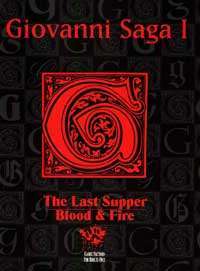 Giovanni Saga 1 compiles the out-of-print first two parts of the Giovanni Chronicles: The Last Supper and Blood and Fire. This award-winning storytelling series is destined to be made available in two volumes and now you can possess the first, which tells the birth of the upstart Giovanni clan. Create Vampire history after your own image. Yes. Just like the original compilation of G.C. I and II, there is a missing page - partial stats for the Brujah and Gangrel members of the Children of Isaac - that was never 'filled in' until an appendix in one of the later volumes (can't remember which one). Can't think of any decent excuse for not fixing that problem during the compilation of I and II, let alone during digital conversion.